The conversation probably occurred fifteen years ago. And yet I remember it like it was yesterday. I had just finished a workshop for first grade teachers. Required for all of the first grade teachers in our district. Some people that wanted to be there. We were looking through the evaluations. Most of them were great. People had enjoyed the workshop. Had learned things that they thought would positively impact their teaching. Felt the workshop was well organized and well presented. There was one evaluation, however, that was awful. The teacher had not thought it was a worthwhile experience. Hadn't learned anything she could take back to her classroom. Didn't think I had done a good job presenting. I looked at that evaluation for a long time. Probably three or four minutes. And then Deb took it out of my hands. "Why are you looking at that?" she asked. why are you spending time looking at the bad one? You know what I do with those?" and threw it into the trash. we would need to look at them. We would need to figure out what to do differently. Almost 40 people thought you did a great job. We need to listen to those people." I feeling that same way tonight. the last day of the month. I'm not feeling the sense of jubilation this year. I didn't make it all 31 days this year. I skipped a couple of days in the middle of the month. at least ten every day. for not writing that weekend that I missed two slices. There was some pretty major stuff going on with the boys. and would have had to go to Kinko's to slice. I started again as soon as I could. I could have just quit for the month. and I didn't do that. I simply. didn't write every day. I usually do at the end of the March. Instead, I'm feeling like a big fat failure. I didn't slice every day this month. Tuesday afternoon. I watch the presenter as she facilitates the district meeting. She is young, probably in her early thirties. Every once in a while her screen saver comes on and shows a really cute toddler, a little guy with dark hair and dark eyes. She works the room before we start, touching base with each individual teacher. She knows them- knows their classrooms, their principals, their schools. She also knows about their families and takes time to inquire about husbands, children, spring break plans. And there are lots of hugs. She tells us she has about ten years teaching experience in second grade, in an ELA-S classroom (that's my district's code for teachers who teach English language learners, the S means she is fluent in Spanish and spends part of the day teaching in that language). And then the session starts. She is clearly very bright. Knows her stuff. Her presentation is focused and interactive. There is a nice blend of information and activity. She shares the most recent information on our district's efforts to bring in the "Seal of Biliteracy" then moves quickly into demonstrating a technique for integrating academic language into Spanish classrooms. We end up as partners in a small group and she is oh so kind as I fumble to speak Spanish, modeling, providing vocabulary and sentence stems, giving me feedback about what I am doing well, teaching me a few new words and phrases. Here's the really fun part of this story. I know this presenter. I have known her for a long time. Ten years ago, I was in my first year as a literacy coach at a mostly Spanish-speaking school in Northwest Denver. It wasn't a high point in my career- I had adopted the boys about two years prior to this and had realized the previous spring that I was not going to be able to balance the demands of an administrative position and single parenthood. I was still sad about giving up the dream of becoming a principal in an urban setting. At that time, L was a first year teacher. A really first year teacher, having just finished a degree as a theater/music/Spanish major. She had never taught. I'm not sure whether she had student taught. Together, we walked through those first three years. I worked with her on classroom management. Parent communication. I taught her to take running records. To do guided reading. We wrote unit plans together. I substituted the day she got sick in class. She was a coach's dream- full of questions, eager to learn, quick to implement anything she was taught. Two years later, as a new teammate came and L and I mentored her together. I left that school after three years, but we have kept in touch, and I have loved watching her grow and develop into a really capable veteran teacher. I'm not quite ready to retire yet, but it's good to know that when I am, there are people ready to carry on. Ok, so I'm just going to admit it. Right here, right now, as the kids at school would say. That organizational stuff eludes me. And I should be cleaning. and give away a bunch of stuff. the wheeled crate I use to present. I need to clean out my car. And it all seems totally overwhelming. And then there is the errand stuff. I need to call the apartments where Isaiah lived in Phoenix. I need to call Public Service and Comcast in Phoenix. His lease is finally up. And I need to turn off everything. I need to call my insurance company. And figure out why the brakes are making a funny noise. about the squirrels that seem to have moved into my attic. And get estimates on the tree in the backyard. But that organizational stuff eludes me. had never been set up. Got all of the shelves put together. a whole bunch of new guided reading books. but we don't have shelf space for them. and put them in front of the shelves. But I have been told they need to be shelved. And we are going to run out of shelves. And it feels totally overwhelming. It's 3:30 on Friday afternoon and spring break has officially begun. The mariachi band is practicing, but other than that, few students remain. Teachers are clearing out pretty quickly today too. I, however, am not leaving. The Personnel Committee is conducting interviews for next year, starting at 3:45 and we will be at school until almost 7:00. I walk into the library, where we are interviewing and am surprised to see one of our eighth graders sitting at a computer. M turns around when she sees me. "Dr. Wilcox, do you know how to spell Holocaust?" I spell it for her. "Yeah," she says, "that's how I spelled it. I found three definitions and I'm not sure which one is right." She reads the three definitions to me. 1. Great destruction resulting in the extensive loss of life, especially by fire.2.a. Holocaust The genocide of European Jews and other groups by the Nazis during World War II: b. A massive slaughter: 3. A sacrificial offering that is consumed entirely by flames. "You're trying to find out about Hitler, and Germany, and the Jews, right?" I say, still not entirely sure where the conversation is going. "Yeah" she says. "I never heard about that before," she says. "I never heard about the Holocaust. "No?" I say, a little surprised that this smart, smart girl, one of our top eighth grade students, has somehow missed such an important event in history. "I think it's the second definition you want, then." M continues. "And I don't think anyone else in my family did either. I think I'm the first person in my family to hear about the Holocaust." I am surprised again. "You are?" I say. "Yeah," she responds. "My dad and mom never finished high school. They don't know about stuff like this." Then she seems worried that I will think badly of her family. "But they are really smart," she says. "My dad is a really good mechanic. And my mom knows a lot about people. She's really good with people." "There are all different kinds of smart," I say. "It sounds like your mom and dad really are smart people." "There are a lot of websites for the Holocaust," M says, eyeing the really long list that has appeared on the screen. I look over her shoulder and see that the second or third one down is for the National Holocaust Museum. "Try this one," I say. "I'm sure that will be a good resource." "Did it really happen?" M asks. "Why do you think people would do that to each other?" I tell her I don't know, that I am sometimes surprised by how people can be so incredibly cruel. "But what did they do in those camp things? What were they? Did they just work?" I try my best to explain, as simply as I can, in the two minutes I have, a little about concentration camps. That people were taken there against their will. Because of their religion. That sometimes others who helped the Jews were taken too. That all of their things were taken away. That the conditions were horrific- crowded, no beds, no food, no heat, families split up, etc. That many were killed. And that others died because of the conditions. "And is it true that they killed people in the showers? Did they really do that?" I think she is talking about gassing people. I try again to explain it. My principal comes in on the end of the conversation, all ready to interview. She stops long enough to give M a hug. "You doing ok?" she asks, completely unaware of the Holocaust discussion, and referring instead, to a difficult family situation that I have only heard rumors about. I can tell that M is not quite done with her research. "Do you have a computer at home?" I ask. "We don't have internet," she says. I tell her she can go to the library and use the computers for free. "I don't have a card," M says. "The computers were down when we went to get one. We have to go back again." "Maybe you can do that over break," I say. I head into the library to interview and M heads out the door. And once again, the reality of life in an urban school completely breaks my heart. A smart kid. Bilingual. Good grades. Plenty smart enough to go to college. With a family who loves her. And yet a kid who doesn't have an extensive pool of background knowledge. Or the resources to acquire it. That can't even get the system to work well enough to get a library card. And I wonder, for about the millionth time, about this land of opportunity. for the 10:30 docket time. The boys do not arrive until 10:28. The walk across the courtroom with their sister. I have not seen them for two weeks. They do not make eye contact. what they have been eating. The judge calls our case numbers. One for each of the boys. I sit on one side of the podium. The boys sit on the other. whether they should come home. Now. Or in 30 days. Or sixty. Or 90. Or six months or a year. I want them to come home right now. I want to feed them. I want to send them for hair cuts. all the hurt of the past few weeks. Instead I draw a deep breath. I still have not heard apologies. that they are still smoking. Neither has a full time job. I feel like I need to say something. I say, "It was forever. And it is still forever. But I am not willing to live with addicts." And so I say, "90 days." "I was living with her before. And now we are basically homeless." I wonder what is happening with his father. is living with an older brother. The judge does not blink. "Ninety days," she says firmly. The boys' sister does not want to see me again. Ever. She just wants to stay in touch with her brothers. I sit alone as the clerk finishes copying the paperwork. The boys are across the courtroom. Then I head to the car. but I cannot stand it. Sometimes love is way too hard. Does a hyphen really matter? Son #1 wanted to keep his last name. Son #2 wanted to take my last name. I wanted them to have the same last name. if we did the right thing. First, it's a huge logistical hassle. Careless clerks omit the hyphen. can you give me a date of birth? to jump in with both feet? about being a forever mom? I wonder about that hyphen. So tonight I'm thinking about the kids that are easily overlooked. One of the shortest kids in the class for a long time. but definitely a kid who shows up every single day. A kid who you can always count on. I make a point to talk with kids like E.
Try to connect with them. Yesterday I saw E in the cafeteria. since we had touched base. Asked him where he was going to high school. to any number of places). "No one has sent me a letter yet." This is a good kid. "It will come soon," I assure him. I tell him I will talk to our high school selection person. And see if she has heard anything. on my way out to recess duty. She will check after lunch. probably twenty minutes since I have last seen him. is eating at his heart. after lunch. Which I do. on the school that is his first choice. I ask if I can bring him to talk to her. She looks at me a little strangely. "I was going to go up there in a little bit." "I'll bring him to you. Save you a trip." I hurry up the stairs. Locate him in science class. Tell him the counselor wants to talk to him. He looks nervous and I assure him that it is good news. his name on the list. His smile could light the whole school. with his two best friends. I see you, E, I see you. A sunny spring Saturday in Denver. I teach, run by home to change clothes, then head downtown to for Book Club. 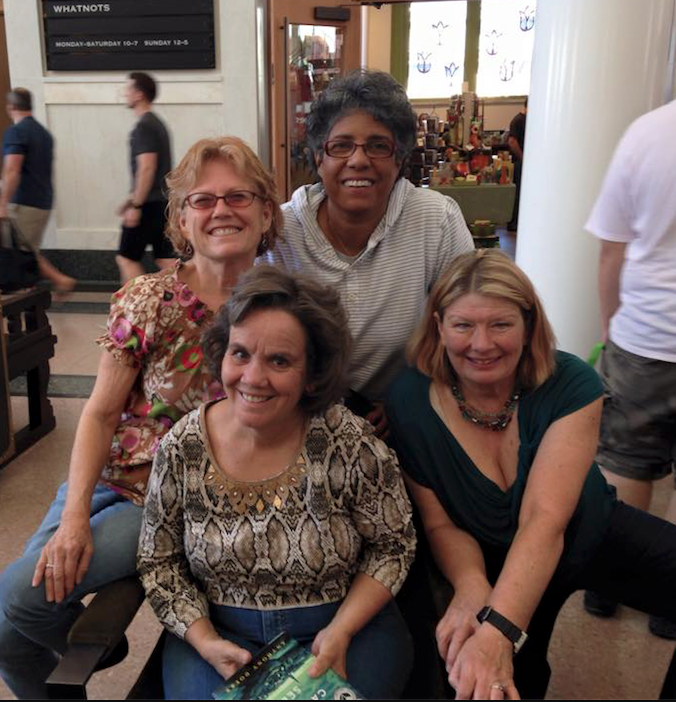 Other members have come and gone, but six of us have been meeting for almost twenty years. Today's book is, ALL THE LIGHT WE CANNOT SEE by Tony Doerr. I loved it and can't wait to talk about it. Union Station has been open six or eight months, but I have not been down there yet. I wander through a huge lobby, looking for a what seems to be a non-existent piano that Val has designated as the meeting area, and wondering how I will ever connect with anyone. My ADD self, which doesn't usually do enclosed shopping malls, kicks in, and I struggle to find the piano, because there is so much else to look at- people, little shops (Hey, there's a sign for Tattered Cover Books, did they move over here? ), gorgeous antique architecture and fixtures. Just when I am about to ask someone if there is another lobby with a piano, I hear someone calling my name. It is Brenna, who has staked a claim on a quieter corner. Soon Brenna spots Val across the lobby and calls on her cell phone. "Turn left! No, left again. Turn around. We can see you." Brenna and I laugh as Val follows the somewhat convoluted directions, finally spots us and makes her way across the lobby. Brenna and Karen head off to find a beer, while I hold down our encampment in the lobby. We know Karen is not coming- she is at a funeral in Saint Louis, but Terri is supposed to be arriving by light rail. No one has heard from her, but after fifteen minutes, we decide not to wait any longer. It is time to bring our final member into the conversation. Laura is not in Denver right now. She is eight or ten thousand, or maybe a million miles away in Hong Kong, doing a two year stint as director of professional development at an international school corporation. In December, we chose our books for the next six months, so she could buy/download them. And every month, she joins us via Skype or FaceTime or telephone, from her apartment in China. Brenna is our technology guru, who makes it all come together. Today it takes several attempts. No connection via Skype. Nothing via FaceTime. "I'm going to try calling," says Brenna. But then Laura's face pops up on the iPad. It is early in Hong Kong, only four on Sunday morning and she is still in bed. We wonder for a minute why we decided to meet at two, and promise that next month we will meet a little later. Laura assures us she doesn't care that we have called so early and reaches for her glasses and her book, ALL THE LIGHT WE CANNOT SEE, by Tony Doerr. Let the book talk begin! Terri arrives and somehow manages to find us in that huge lobby. She makes her way to where the iPad can see her. Some months, depending on what has gone on in people's lives, and on people's interest in the book, we just talk, and the book kind of takes a backseat, but today we are ready to talk book. This meeting has been rescheduled several times and Brenna, Laura, and I finished the book over a month ago. Val, an avid reader, has read several other books, including THE GOLDFINCH, but has not finished ALL THE LIGHT. A spirited conversation ensues as we make our way through the book. "What page are you on?" "Wasn't that the grandfather, it was her grandfather on the radio, wasn't it?" "What actually happened to the climax?" "Could you believe how it all came together, right here?" "Do you think that's really where the whole thing came together?" And so we sit, four fifty-plus women, in the middle of Union Station, surrounded by young and beautiful people, talking about our books, for almost an hour. Finally, Brenna's phone is almost out of juice, Val has to head off to Fort Collins for an evening with a new friend, and Laura is ready to go back to bed. We make plans for next month, BOSTON GIRL, April 11, place to be determined, I think. We say goodbye to Laura, "Love you sweetie! Miss you! Only a couple of more months until June!" and the screen goes blank. Brenna, Terri and I head across the street for a burger and continue the conversation- books, life, Laura's dog, my boys. We have been reading talking books and loving each other for almost twenty years. But the chairs are empty. Sprite. Sour cream and onion potato chips. I don't eat any of that. Old Spice. Hair gel. A razor. It has been a long long week. in seventy or eighty or ninety minute units. Wondering whether they have found jobs. If they have gotten hair cuts. How much they are smoking. and watch the sun go down. Maybe read for a little while. Then go to bed. Early. And sleep for about twenty hours straight. and turn on my computer. and a powerpoint to prepare. when I walk into kindergarten this morning. I sit down across from him. at his adamant tone of voice. "My mom is in jail,"
"I am so sorry, J.
I think about the gold jumpsuits. to visit via video cam. And then I give J a hug. and I just prayed and you came." we drive by the middle school. "I don't think I'm going to go there,"
"Do you want me to get out of the car?" but he is so happy here. "You just gotta trust me. So, first there's the act where a single mom, strung out on drugs, loses custody of her four kids. And then there's the act where those four broken kids spend several months sleeping on a cot in a garage in their first foster home. And another act where they spend four years with a foster mother who beats them, and doesn't feed them. And then there is the act where the assistant principal from their school takes them home with her. And tries to put the pieces of their little hearts back together again. Deals with food hoarding. Deals with meltdowns in Target. Tucks them in every night. Tries to teach them that she will always be there. And adopts them. And then there is the act where the adoptive mom cooks dinners. And does laundry. And homework. And goes to parent teacher conferences. And buys sports gear (a lot). And takes them to sports practices (many). And cooks pots and pots and pots of spaghetti and chicken fettucini for team dinners. And cheers for them at games. And spends vacations in Kansas and Memphis and Las Vegas and San Diego for basketball tournaments. And sits in emergency rooms when they are hurt. And then there is middle school act. Where they spend hours at the kitchen table every night doing math homework. When she tries to teach them how to work hard.Stay away from peer pressure. Buys great snacks so kids will come. Has middle school sleep overs every weekend. Deals with their surly moods. And the high school act. More of the same. The high school football hangout. Lots of ugly parent teacher conferences. Teaches them to drive. Buys cars. Fights about marijuana. Deals with insurance company after accidents. Deals with legal issues. Transfers one to alternative school. Two diplomas. And then the act where she sends them off to college. Drives to Phoenix. Hugs them goodbye. Cries. Misses them. Horribly. Sends lots of money for groceries. Sends care packages. Worries. Prays. And then the act where they both come back to Denver. Do not work. Do not go to school. Smoke lots of pot. Sell "unnecessary" things like the lawnmower (which is, I guess, kind of unnecessary in January) to make money for more pot. Fight with their mother about the no jobs and pot. A lot. And then there is the act where both boys make poor choices and end up in the county jail. And the adoptive mom tells them she will always be their mom, but they cannot come back until some things changes. And she cries as she watches the locksmith. And the act where the adoptive mom goes to court to watch her sons be charged. A quick glance of recognition as he sees adoptive mom, but then he will not look at her. And she cries as the bailiff gives her older son a box of kleenex because he is crying. And the act where the adoptive mom is sitting in the court room. And another woman keeps making faces at her and mouthing words. Acting like she is mad at the adoptive mom. And the adoptive mom has no idea who the other woman is. Or what she wants. Or why she could possibly be mad. And there is a man in the courtroom. About fifty. Very tall. Dressed in a uniform from a local car dealer. Maybe a mechanic. She notices him but doesn't think much about it. There are lots of mothers and father sin the courtroom. And then there is an act where Son #2 is brought into the court room. And he keeps mouthing things to the man and the woman. And at first the adoptive mom wonders who he is talking to. There are several young women in the courtroom and she wonders if he has a girlfriend she doesn't know about. And then there the act she figures it out. The boys' biological mom. And Son #2's biological father. They leave the courtroom. And she thinks they are probably in the lobby and she goes out. But they are gone. And then she walks back to the parking lot because her cell phone is in her car and she needs to call a police detective. And runs into the father. And introduces herself. He hates the bright sunshine, just like his son. And they duck into a coffee shop and he buys her a coke and they talk for an hour and decide the boys will go live with him. And then there is the act where she drives downtown for the third time that day for visiting hours at the jail. And she is not sure whether the boys will want to see her, but she is especially worried about Son #1. The sheriff explains video visitation. Wait. Again. When the inmate appears, pick up the receiver. Son #2 is first. He begs her, repeatedly, to bail him out. Which she tells him, repeatedly, will happen tomorrow after the charges are dropped. He wants to talk the whole thirty minutes. Tells her every few minutes how much time they still have. Does not stop talking until the monitor turns off after thirty minutes. And then there is the act where Son #1 comes onto the screen. And asks her, several times, why she has come. And tells her to bail him out. And hangs up. After 5 minutes and 44 seconds. And she watches as he runs back up the stairs in his gold prison jumpsuit. And wonders if she has said goodbye to him for the last time. Life. A play in many acts. I've missed the last two days slicing. I'm sad, because the last three or four years, I've made it all the way through. I have been in the middle of a huge "situation" with the boys. And it's been really, really hard. I'm participating in the month-long Slice of Live writing challenge at Two Writing Teachers. This year over three hundred teachers are slicing every single day for the entire month of March. Head over there and read some more slices. And then most Fridays, I participate in POETRY FRIDAY. If you are in the mood for a little poetry, head on over to Laura Shovan's Author Amok. Her featured poem, "Shame is the Dress I Wear" is gorgeous. Can't wait until April, when Laura will be featuring poems about clothes and Mary Lee will be writing poems about emotions. passed away the morning of the 10th of March. Preliminary examinations are that it was heart failure. She died peacefully in her sleep. and on her late slip she wrote, "Family Problems,"
I'm participating in the Slice of Life at Two Writing Teachers this month. I will be capturing a slice of my life. I'm on a borrowed PC computer while my Apple is in the shop. I can't figure out how to download the SLICE graphic on this computer. Last year she wowed the sixth grade with her creative hair styles. I couldn't wait to get to school on Mondays and see what new design was shaved into C's hair, or what new color scheme was featured. And she plays basketball, but her favorite sport is soccer. This year she petitioned the head of the DPS athletic department to see if she could play on the boys' team because she feels like she needs more opportunities to practice and her family doesn't have the money for her to play on a competitive team, even though she would probably do really well. And she has a killer voice and is a lead in our school Mariachi band. Last May, she told me she was most proud of having perfect attendance, because in fifth grade she had not taken school seriously, and she had worked really hard to do better in sixth. But today, she is falling apart. Fifteen minutes before the beginning of Blessed Event, Unit One. We are in pre-test mode, all of the middle schoolers have been sorted and are in their testing rooms, but materials have not been distributed and doors have not been closed. Kids are finishing their sausage biscuits and starting to wipe off their desks when I arrive in the classroom. The social studies teacher greets me with a slight nod and I follow his eyes to C's desk, where a small crowd has gathered. I walk over to her desk. C nods, but I can tell she is not. "You want to take a walk?" She follows me out into the hall, where I attempt to find a quiet corner. It's not easy this morning with all 120 middle schoolers taking a bathroom break before the test. "Are you sick?" She shakes her head no. "Did something happen before school this morning?" "Here at school?" She shakes her head yes. "Someone in the other seventh grade?" She does. The story comes out in a rush. She liked a boy. She won't tell me his name, but I have seen them on the playground, hanging out in the adolescent version of parallel play. A really nice kid. Smart. Respectful. A fellow athlete. But now soccer season is starting and she wants to concentrate. She broke up with him. His feelings were hurt. He said something mean about her. Called her a name. He is supposed to be her friend. Friends don't say mean things about each other. Her shoulders shake with silent tears. We are interrupted twice during the story. L, the biggest guy in the seventh grade, comes up the stairs. He sees her crying, and wraps his arms around her in a bear hug. Then R comes out of his eighth grade classroom, all energy, bouncing from one side of the hall to the other in his usual pinball ekfashion. He is on his way to the drinking fountain, but stops when he sees C crying. "You want me to beat someone up for you? Just tell me. I can take care of it." He is only half kidding. I ask if she wants help solving it. She doesn't. She wants to talk to him herself. I tell her that there are people who can help if she needs us. Me. The principal or assistant principal. The male teacher. Our fabulous school social worker. She wants to handle it.She doesn't need any help. She will do it at lunch recess. My boss walks by, eyebrows raisedWe are now at five minutes until test time. I wonder, as upset if she is, if we should pull her and have her do a makeup. I ask what she wants to do. "I can take it," she says, drawing in a deep breath and squaring her shoulders. "I just need a drink of water." I ask if she is sure. She is. She heads down the hall for the fountain. I head back into the middle school classroom, wondering whether she will really be able to pull herself together, knowing that sometime within the space of the next two minutes, C must switch from total emotional mode, into total academic. There are so many layers to life in school. So many stories that test scores don't tell. I just wish people really knew what we do every day.